Yustrich is at the top- Jaime Lema (San Lorenzo de Almagro) below. 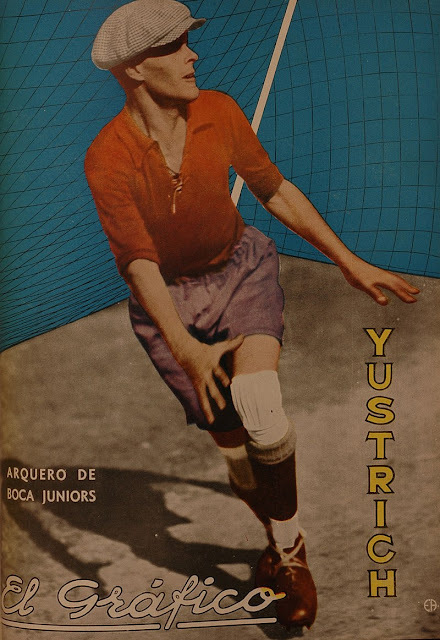 Juan Yustrich was Boca's first choice goalkeeper from 1932-37, winning league titles in 1934 and 1935. He represented Argentina once (in 1940). 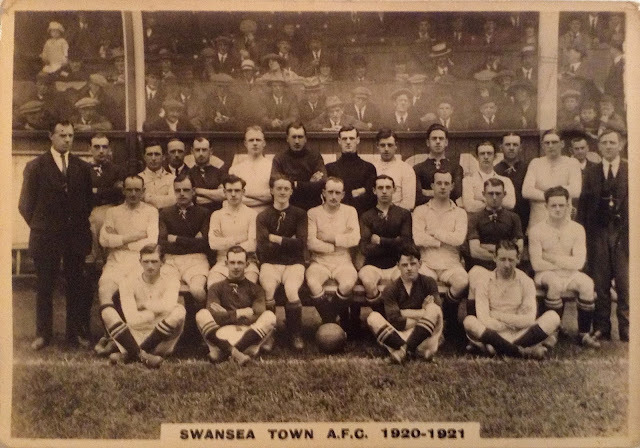 Welsh Premier League club Aberystwyth Town (founded 1884) has provided Wales with 7 internationals (18 appearances). The club's predecessor, Aberystwyth, also produced 1 cap. When Wales faced Scotland at Dundee on 21.03.96 there were 3 Aberystwyth Town players in the team. 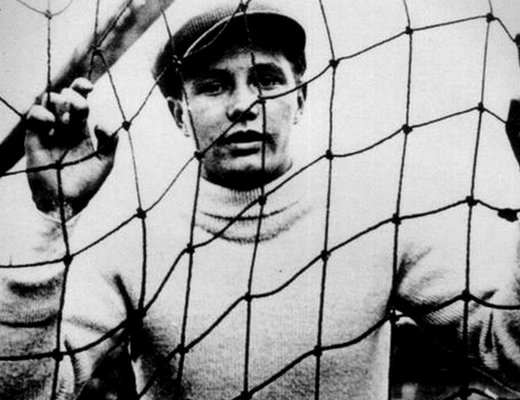 The legendary goalkeeper Leigh Richmond Roose was said to have worn an Aberystwyth Town jersey as an undershirt throughout his first class career. Hughes had made 1 previous appearance for Wales whilst he was playing for Cambridge University. Aberystwyth born inside left who founded London Welsh AFC and was briefly at West Bromwich Albion (see here). 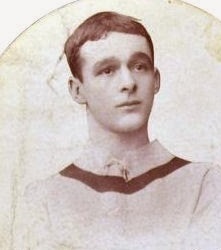 Aged 18 at the time of his debut, Morris went on to win a total of 21 international caps, playing for Swindon Town and Nottingham Forest. Known as the Prince of Inside lefts he scored 9 international goals. This was Roose’s debut. 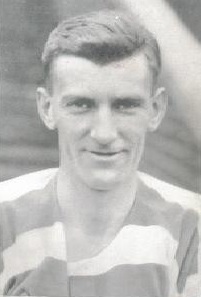 He moved on to London Welsh, Stoke, Everton and Sunderland (among other clubs) and won a total of 24 caps. His association with Aberystwyth began when he attended University in the town. 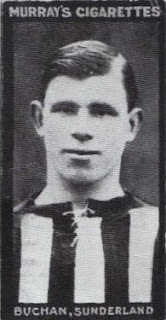 A native of Aberystwyth, left back Peake won a further 10 caps whilst playing for Liverpool. In The Cambridge Companion to Football (2013) Peter Stead refers to D.H Lawrence as the only great modern British novelist from a working class background . In his 1913 story Strike Pay, Lawrence describes a group of striking miners walking to Nottingham to watch Notts County play Aston Villa on a Wednesday afternoon. It was a good match between Notts and Villa — no goals at half-time, two-none for Notts at the finish. The colliers were hugely delighted, especially as Flint, the forward for Notts, who was an Underwood man well known to the four comrades, did some handsome work, putting the two goals through. Notts played Villa in a rearranged League match on Wednesday March 13th, 1912. Billy Flint was indeed from Underwood. He was a versatile player who represented County 408 times (1908-26). 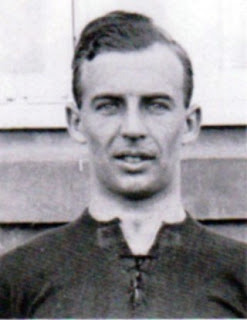 Whereas Lawrence has Flint as the scorer of both goals, former Villa player Billy Matthews was the scorer of the second. Notts went from 15th to 14th in Division 1 as a result of this win, Villa were 6th. The return match 3 days later saw Villa win 5-1. 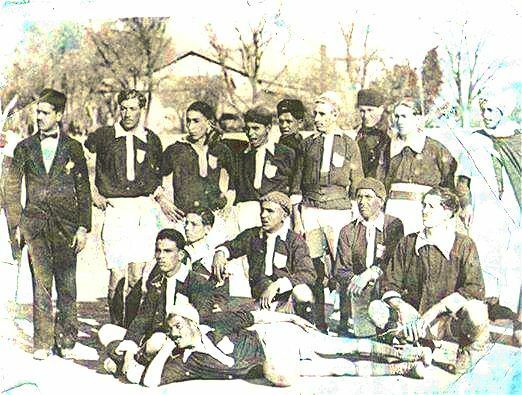 L’étoile musulmane Mascaréene (founded 1908) - the team that evolved into Gallia Club de Mascara (1924). This picture dates from c 1916. Wisden, a name more often associated with cricket, was also a supplier of football goods. Testimonials from the 1st Battalion Scots Guards (who used the 7/6 ball daily for 3 months) and Charterhouse School (ordering a 12/6 ball for the game vs Old Carthusians). The Corinthian cost the equivalent of about £60 at today's prices. FIVE or six years ago who could have foreshadowed the visit of an English football team to Germany as within the scope of practical politics before the end of the century? Six years since, the game was unknown, at least to the bulk of the youth of Germany. At that time, it is true, there were international contests of a kind. In 1893, Herr W. Bensemann was captain of the Carlsruhe (sic) Football Club. An enthusiast of enthusiasts, in his hands football in South Germany was bound to develop. Through his initiative, international matches were arranged and duly carried out. Teams representing South Germany played in Paris and in Switzerland,if not in other European centres. North Germany was not fortunate enough to have a leader of Mr. Bensemann’s energy.Football there, indeed, is only the product of the last two or three years. That it should have made the headway it has in this short space of time says a great deal for the zeal of those who are responsible for its management there. Until quite recently it would not have been possible to have played a match of any pretensions in Berlin. There was in fact no ground which could have been enclosed. In the last few months this want has been remedied, and the excellent ground close to Charlottenburg, known as the Sport-park, on which the Englishmen played their first match, will bear comparison with the majority of our English football enclosures in respect of its playing condition. That English players went out this year was mainly due to the enterprise of Herr Bensemann. It was at his insistence that the Council of the Football Association accepted the invitation of the German Central Committee to send out the best team they could of English players. For some time it looked as if Mr. Bensemann had reckoned without his host. In Hamburg as well as by the South German Association the undertaking was coldly received. The trip was regarded as premature by both these bodies. Objection was made that it was not possible to collect a team thoroughly representative of German football. Whatever their reasons the objectors did their best to make the tour impossible.The South German Association even went so far as to threaten any of their players taking part in the matches with suspension. In some cases it became more than a threat in more than one instance actual suspension was the result. Whether this attitude was right or wrong, whether it was sportsmanlike or the reverse, it is not for us to say. The fact is only mentioned to show the difficulties against which Herr Bensemann and his colleagues on the German Central Committee had to contend. Indeed until within a few days of the departure of the English players it was uncertain whether the trip would come off. But the Central Committee, to their lasting credit be it said, carried out all their engagements to the letter. Events showed,too, that their judgment was correct. The fears that had been expressed by those who opposed the project proved to be visionary. From first to last the English players, professionals as well as amateurs, had the warmest reception. Officially they met with profuse hospitality everywhere unofficially, all classes received them with courtesy, in many cases even with a hearty welcome. Nor is it unreasonable to hope that the football players of Germany and Austria will benefit materially from the examples of such all-round experts as Bassett and Rogers, of Holt and Crabtree. In goalkeeping the Germans have little to learn. Even Waller, excellent as he is could have taught them little had he been called upon to any great extent, which he was not. Altogether the form of the German players was full of promise. The best all-round play was seen at Prague; but football there has been played under better conditions. In one important respect the Germans want little teaching. They played the game in Prague, Berlin, and Carlsruhe alike in the proper spirit, avoiding on the whole anything approaching to roughness The forwards were fast, most of them, and showed fair 'combination. They only want experience to play really well and the improved form of some of them at Carlsruhe showed that they had already learned a little of the science of the English players as the result of the previous matches. The defence at Prague was the best we saw It was more level and certainly the backs were more severely taxed there. Still the best defensive player was Ivor Schrieber (sic), who captained the teams at Berlin and Carlsruhe. As a half back he is distinctly promising, fast,and sure to be clever with more experience. At full back,his brother, E. Schrieber (sic) , Kohts and Westendorp at Berlin,Hildebrand and Mayer at Prague, were all fairly good. All the three goalkeepers were excellent. W. Langer was a bit uncertain in the first half of the second match at Berlin. At Carlsruhe he kept very well, as did Eichelmann at Berlin and Troy at Prague. 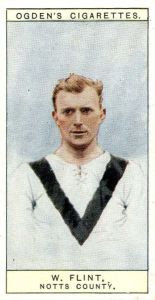 The successes of the English eleven were Rogers, of Newcastle United, Holt and Crabtree. Rogers came as something of a surprise forward. He is very fast as well as strong, middles well, and is a good shot. On his form this tour the Selection Committee of the Football Association will do well to give him a trial in a big match. Holt, at half back, played a consistently fine game. He showed all the pluck and science that brought him to the forefront in his early days. Crabtree at full back was at his very best, and his versatility must have been quite an education to the Germans. Bach, of Sunderland, was, of course, overshadowed by Crabtree. Still he played a good game throughout at back. 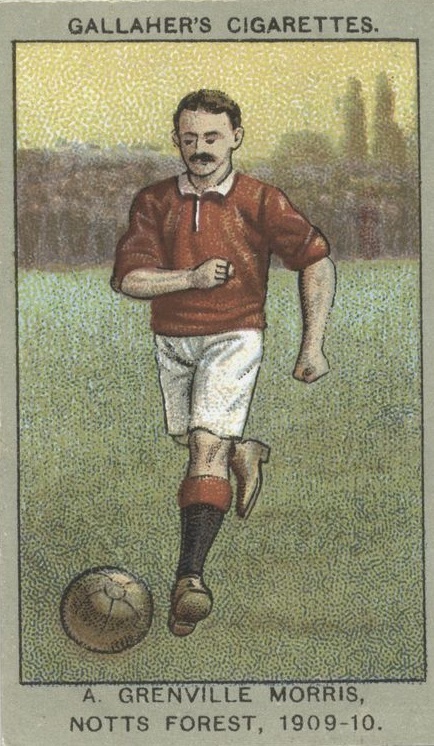 The veteran Bassett, whose first International was in 1888, was in very good form on the outside right in the first match. The other grounds were uneven, and he was unable to show to the same advantage. From a football standpoint the tour cannot fail to do good. Socially too the visit appeared to produce the best of feeling. The English team are indeed not likely to forget the many acts of kindliness of which they were the recipients. Herr Bensemann, who accompanied them throughout, will be the central figure in their recollections of a most pleasurable trip. The brothers Schrieber at Berlin and Professor Leudenfeld in Prague did very much too to add to their enjoyment. Amateurs and professionals met with the same reception off, as well as on the field. There was not a shadow of a distinction throughout the tour. Moreover it is gratifying to record that the most cordial relations existed between all the members of the team throughout. For details of the tour see here. In 1924 Canada toured Australia and New Zealand. Eight of the players (and the manager) were UK born. There were 6 internationals against Australia. 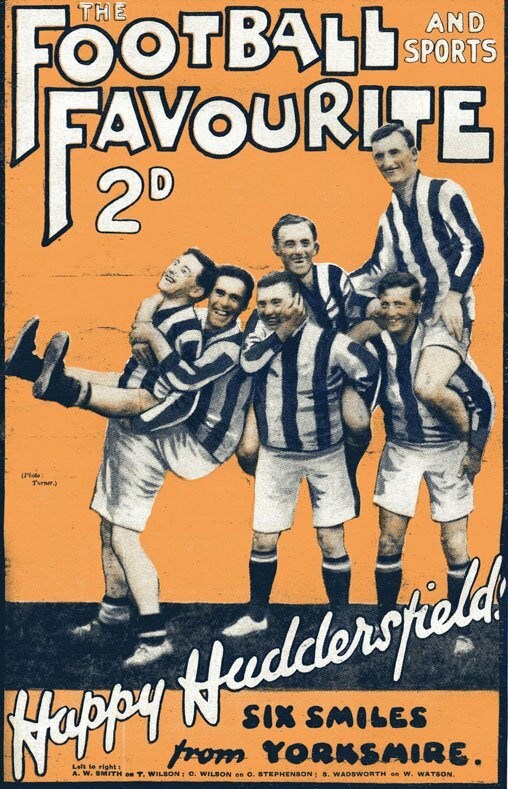 Huddersfield Town dominated English domestic football in the mid 1920s, winning 3 League Championships in a row. Pictured here are Tommy Wilson, Bertie Smith, Clem Stephenson, Charlie Wilson, Billy Watson and Sam Wadsworth. 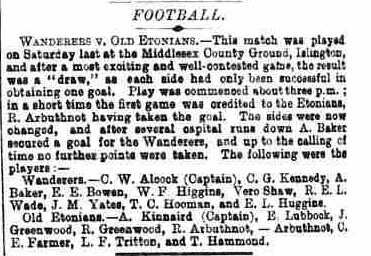 The gentlemen who have expended so much time in arranging the new code of laws for the regulation of the game of football had the gratification of seeing them put to practical and highly-satisfactory test on Saturday last, when the members of the association mustered in good round numbers at Battersea Park, and played a friendly game, there being fourteen on each side. A large muster of spectators, attracted the fine bracing weather and the novelty of the proceedings, attended, and, in common with those who took active part in the game, expressed their entire satisfaction at the working of the new laws. The sides were chosen the Messrs.Alcock, and were distinguishable as President’s and Secretary's,and included following :—Messrs. J. F. Alcock, E. C.Morley, C. M. Tebbutt, C. Hewett, G. T. Wawn, J. P. Phillips, Innes, M'Calmont, Needham, H. Baker, A. Baker, Lloyd, Hughes, Jackson, C. W. Alcock, A. Pember, H.W. Chambers, A. M. Tebbut, Gray, Drew, Graham, Cutbill, Morton, J. Turner, Morris, Renshaw, Lenchars, and Scott. The game commenced shortly alter half-past two, and some very spirited play ensued, which only concluded when twilight was far advanced, and resulted in the President’s Side obtaining two goals. It would be invidious to mention the names of any of the players having distinguished themselves where all were active; suffice it to say, that the afternoon was very pleasantly spent, and so was the evening, by portion of the members and their friends, who retired to the Grosvenor Hotel, Pimlico, where a capital dinner and some excellent wines were discussed the satisfaction of all concerned.The complete list of fixtures of the Barnes Club will appear in Saturday’s paper, and we shall be glad if the secretaries of other clubs will forward lists of their matches to come by Thursday’s post at latest. During the 1914-15 season only 6 of the 40 clubs in the Football League were from south of Birmingham. Of the 20 teams in the first division of the Southern League, 19 would become members of the Football League by the 1920-21 season. La Madelon was a French popular song of the 1914-18 war. I do not know how it came to be the nickname of the Czech footballer Jan Knobloch , but he was, throughout his career, known as Madelon. 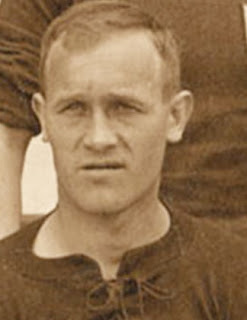 Madelon joined Sparta Prague in 1927 and won the Czech national championship in 1932. 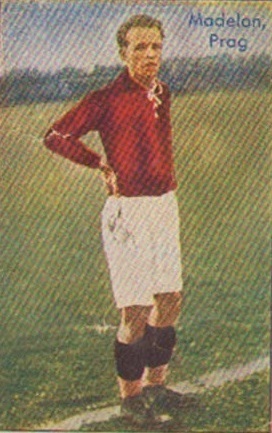 He also made 18 appearances for the Czech national team (1929-33). The image is from a cigarette card by the German company Richard Greiling Zigarettenfabrikan. 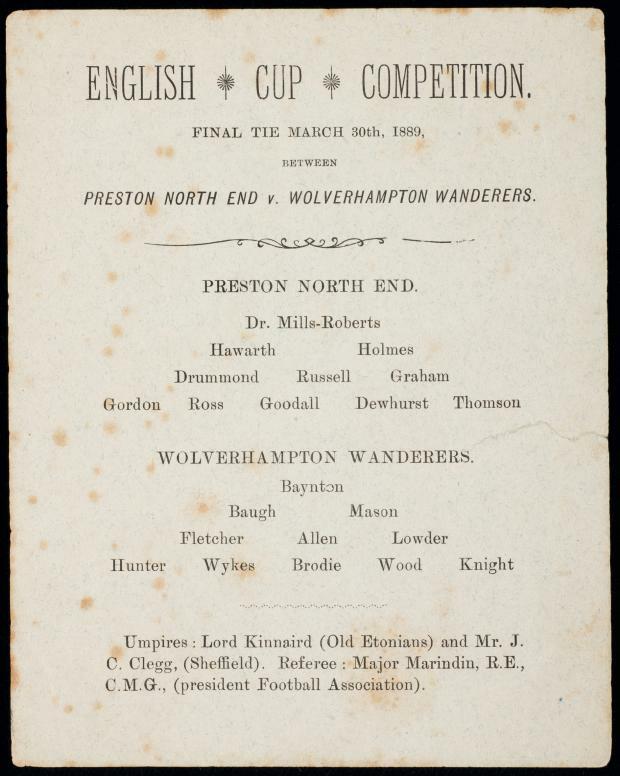 Here is a programme for the 1889 FA Cup Final between Wolverhampton Wanderers and Preston North End's Invincibles (the Cup version, with Mills- Roberts in the place of Trainer). Major Marindin would undoubtedly have been rooting for Wolves' English XI (including 7 internationals). Wolves had finished 3rd in the League, conceding 9 goals across the 2 meetings with Preston. Dewhurst, Ross and Thomson were the scorers as Preston won 3-0 to secure the Double. 1924 was a big year in Bulgarian football. 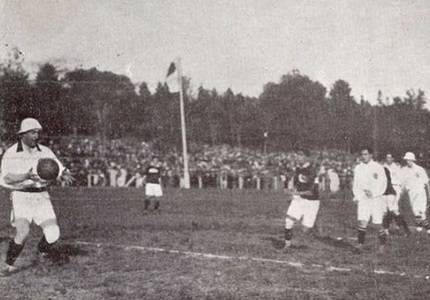 The first national championship competition was scheduled and the nation played its first international fixtures. Regional leagues had been held since 1921, and in 1924 a unification tournament for the 6 regional champions was planned. Unfortunately this was abandoned when Vladislav (Varna) refused to replay their semi final with Levski in Sofia, wanting a switch to Varna as the original tie had been played in Sofia. This was never resolved. The following season's championship was successfully concluded, with Vladislav beating Levski 2-0 in the final. Bulgaria's first international came on 21.05.24 at Vienna's Simmeringer Sportplatz. The team featured 9 Levski players. Austria (in their 87th international) were too strong for the Bulgarians, who held out until the 31st minute. The final score was Austria 6, Bulgaria 0. Bulgaria made 2 changes for their next match, against The Irish Free State at the Olympic Games in Paris. They were beaten by Patrick Dunkan's 75th minute goal. 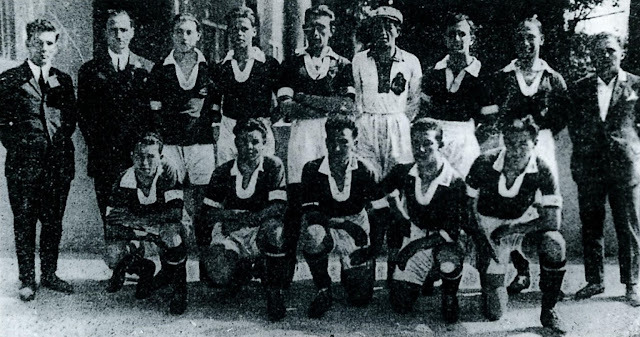 Bulgaria's first international win came in their 15th match, against Romania in 1930. This article tells us so much about the state of football in 1880s. 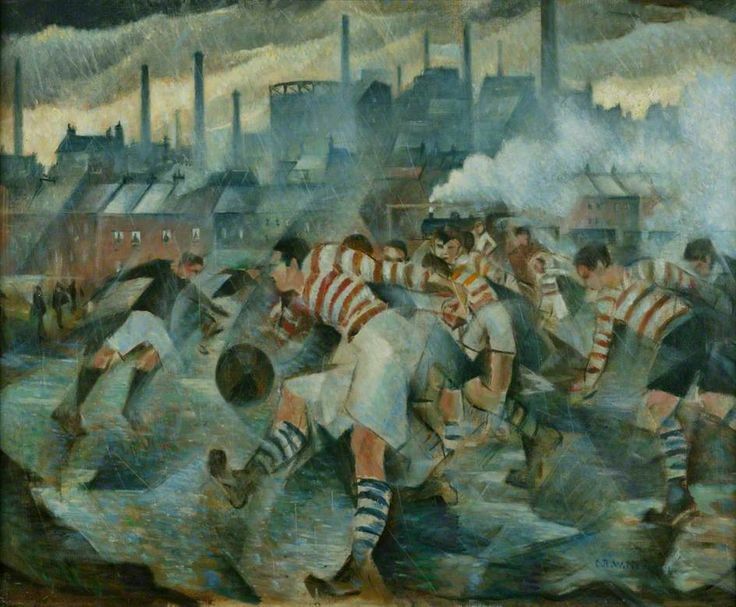 Professionalism was legal, organized competition in the form of the FA Cup and the county cups had firmly taken root in the public imagination. The provinces, particularly the north west and the midlands, had a thriving football culture and there was a railway network that facilitated affordable travel for teams and their supporters. Darwen travel to Chirk in north east Wales for an FA Cup tie. Darwen feature the old English internationals Marsden and Rostron, while in goal they have Hugh Mcintyre, formerly of Blackburn Rovers and Glasgow Rangers. A versatile player indeed, he had represented Scotland at centre half, moving back into goal as his age increased (he was 31). Chirk was a village but they boasted 4 internationals in their line up : William Owen, Di Jones (later of Bolton Wanderers and Manchester City), George Owen (later of Newton Heath) and George Griffiths. In April 1887 this same XI won the Welsh Cup for the first time, and retained it the following season. That Ruabon people had travelled the five miles south to support Darwen against their local rivals (an exclusively Welsh team) is a delightful detail. 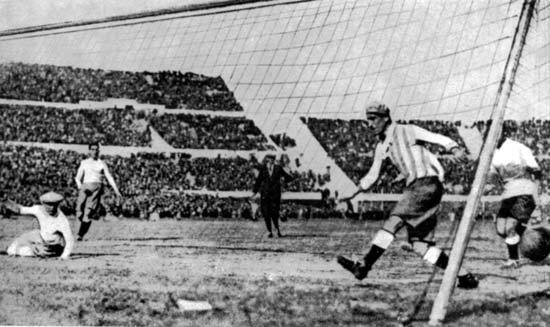 Cunha Bueno, the Paulistano goalkeeper, in action against Palestra Itália in 1917. Zuzu, as he was known, was a goalkeeper of desperation, noted for unconventional last ditch saves executed with all parts of his anatomy. 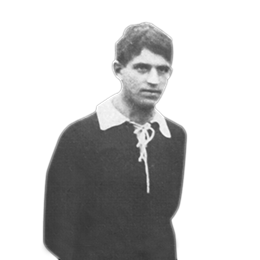 With Zuzu in goal Paulistano won the Campeonato Paulista in 1916,1917, 1918 & 1919. Away from football he was a coffee farmer and exporter. The ball in this photograph looks small. I have read that size 4 balls were used in Italy, I'm not sure if that was the case in South America too. C. R. W. Nevinson was an English artist who was an associate of the Italian Futurists and an official War Artist in the 1914-18 conflict. Any Wintry Afternoon in England was painted in 1930, and can be seen at the Manchester Art Gallery. Sophus 'Krølben' Nielsen- 10 goals v France . Poul 'Tist' Nielsen - featured in 2 double figure wins. 'Påsket' Bengtsson- conceded double figures on 2 occasions. Ireland’s first foray into international football and an inauspicious start. Aston Villa’s Vaughton (5) and Digger Brown (4) did the bulk of the damage. 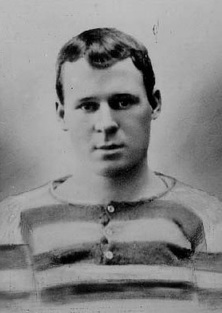 James Hamilton was the goalkeeper to suffer. This remains Wales’ record score. John Clugston on the receiving end. 6 Scots players got on the scoresheet as a miserable month saw Ireland concede 21 goals in 2 matches. On this occasion Ralph Lawther was the unfortunate custodian. 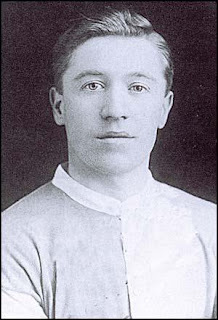 The Times reported that ‘The play might well be described as one long series of attacks on the Irish goal…’ There were 4 goals from G.O Smith and a debut hattrick from Jimmy Settle, Steve Bloomer chipped in with 2. A debut to forget for James Lewis. 4 apiece for Hamilton and McMahon. Irish goalkeeper Sam McAlpine’s only international appearance. The 1900s saw the development of international football in mainland Europe and the establishment of FIFA. England’s full international team was becoming an almost exclusively professional set up. 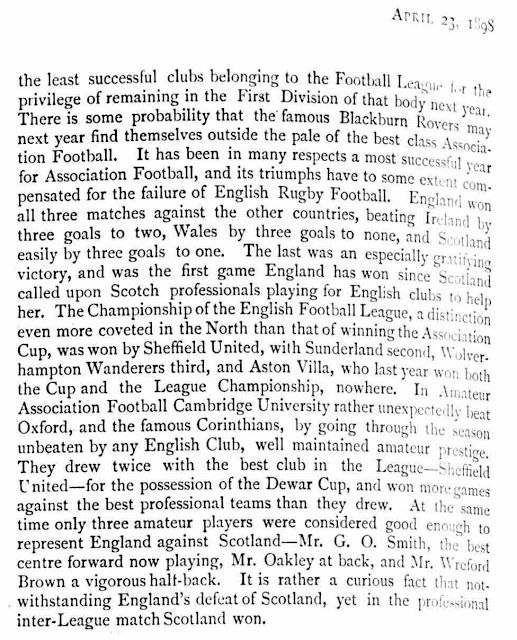 The introduction of the England Amateur XI led to a series of mismatches in which emerging continental teams were thrashed on a regular basis. 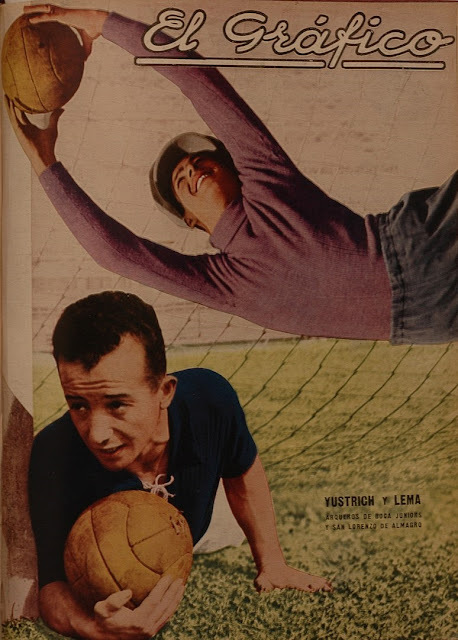 Zacharie Baton was the goalkeeper. Stanley Harris scored 7, Vivian Woodward 4. 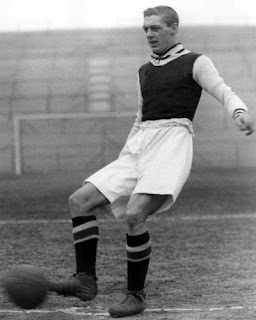 West Ham's Harold Stapely got 5. Lo la Chapelle’s only experience of international football in Netherlands’ goal. André Renaux never got a second call up. Rudolf Donhardt’s only international appearance. Sweden were a goal down in the first minute of this match (a first international for both countries). Erik Bergström and Erik Börjesson scored 4 goals each. After this spectacular start Sweden then had the misfortune to face England Amateurs in their next 2 matches… Sverre Lie became another goalkeeper whose international career lasted only 90 minutes. p 3 w1 d 0 l 2 f 13 a 21. Påsket Bengtsson on the receiving end of Woodward &Co. TEN goals for Sophus Nielsen and the end of Maurice Tillette’s international career (2 matches, 21 goals conceded). Godefroid Van Melderen was the goalkeeper here as England Amateurs maintained their impressive goals to games ratio. France goalkeeper Tessier conceded 36 goals in his 5-game international career, 21 of them in 2 games v England Amateurs. Gottfried Fuchs put TEN past Lev Favorskiy. Russia’s first home game. Schlosser-Lakatos Imre scored 5 goals. Dmitriy Matrin had a memorable day on his debut. Tist Nielsen scored 6 goals as Påsket Bengtsson conceded double figures for the second time in his international career. The Japanese team was represented by a selection from the Tokyo Higher Normal School. Genya Tomita was Japan’s goalkeeper. 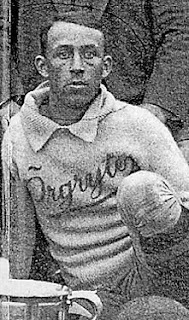 Paulino Alcantara was among the Philippines’ scorers. Tist Nielsen scored 5 goals, Ingolf Pedersen the unlucky goalkeeper. Lali Öhman led the scoring with 6 goals, August Lass the ‘keeper. Lithuania’s 3 first internationals saw them suffering progressively heavier defeats, 5-0, 9-0 and then this. A warm up match for the Olympics, played at the Pershing Stadium in Paris. Valerijonas Balčiūnas was the ‘keeper. 6 goals for Albin Hallbäck. Latvian goalie Arvīds Jurgens went off in the 79th with the score at 9-0. He was replaced for 6 minutes by Ādolfs Greble , who was beaten 3 times during this brief period of deputization. Takács József scored 6. The last of Maurice Cottenet’s 18 international games. 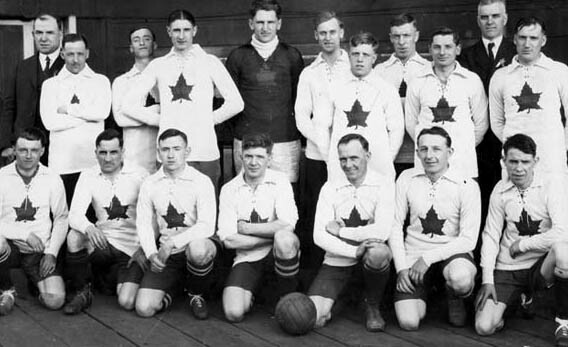 First round match of the 1928 Olympic games at Amsterdam. Cooper in goal for the United Sates. Abdel Hamid Hamdi was in goal. For Italy Schiavio, Banchero & Magnozzi got 3 apiece and Baloncieri scored twice. Harijs Lazdiņš’ international debut, 3 days after his 19th birthday. He represented Latvia 18 times in all. The Italians did not consider this a full international. Robert Dupont kept goal for Luxembourg (the last of his 10 appearances). Giovanni, Serantoni & Bisigato all got hattricks. Eduardo González Valiño (known as Chacho) 6 goals on debut. Todor Dermonski started the match in goal for Bulgaria but went off in the 30th minute with the score at 4-0. His place was taken by Radi Maznikov. George Smith got 5 goals, Alf Smith was the goalkeeper. I'm writing a book about Northern Union, so I'm going to be taking a break from posting on this blog. I intend to return to this in the spring of 2018. Always play fair; be always ready to congratulate your conqueror and you’ll never be sorry for it. I’ve always played fair and tried to play fair. Sam Wadsworth survived the 1914-18 war but suffered from 'Shell Shock' . 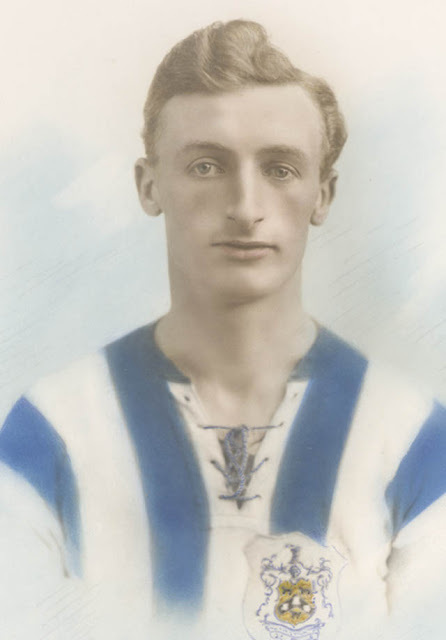 Released by Blackburn Rovers on his return from Military Service he joined Huddersfield Town, with whom he won 3 League Championships and an FA Cup. He also represented England 9 times (4 as captain). He later enjoyed success as a manager in The Netherlands. As I've written before, if I had a time machine I think the first football match I would go and watch would be the 1930 World Cup Final. In the 12th minute 22 year old outside right Pablo Dorado of Club Atlético Bella Vista fired through the legs of Bottaso at his near post. 1-0 to Uruguay. Vivian Woodward played 23 'full' internationals for England, scoring 28 goals. 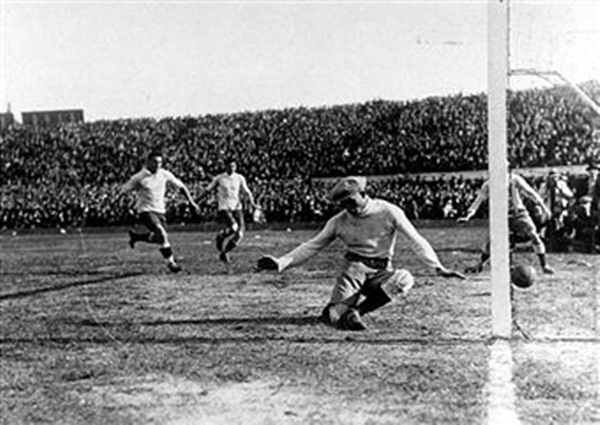 This match, played on April 4th, 1903 was his third. 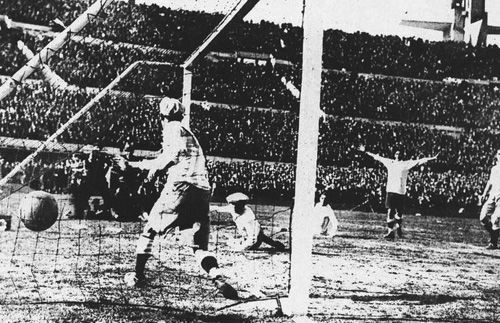 Woodward put England ahead in the 10th minute, scoring from close range following a corner. 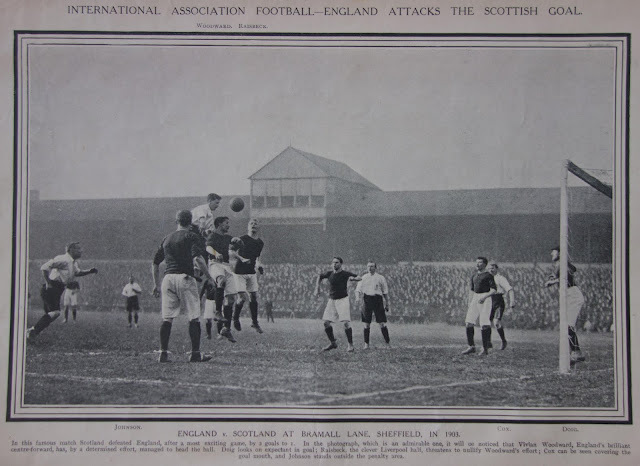 Scotland won thanks to second half goals from Finlay Speedie and Bobby Walker scored within the space of 2 minutes. The County Ground at Islington (also known as The Cattle Market Ground) was no longer in use for cricket in 1869. Some familiar names in the line ups. 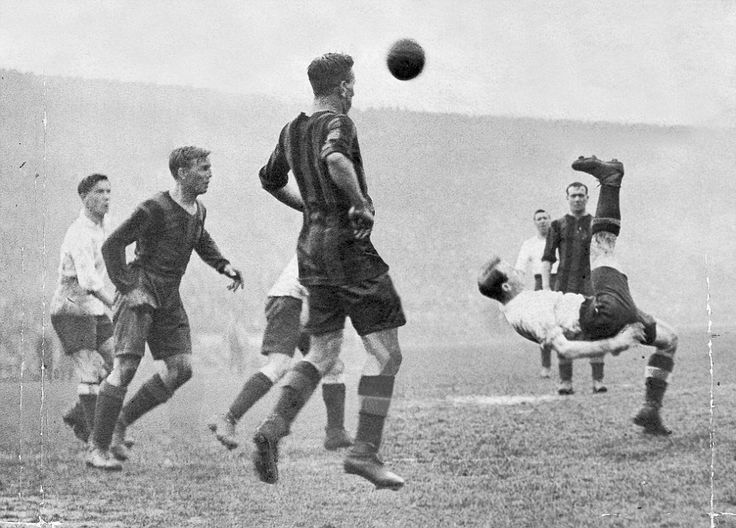 Tottenham Hotspur's Bert Bliss with an overhead kick in the 1921 FA Cup Final. Bliss was an inside forward who made 215 appearances for Tottenham (106 goals). He later played for Clapton Orient and Bournemouth & Boscombe Athletic. His one appearance for England (vs Scotland) came 2 weeks before this FA Cup Final. Tottenham's opponents in the final at Stamford bridge were Wolverhampton Wanderers. 20 year old winger Jimmy Dimmock scored the winner in the 55th minute. 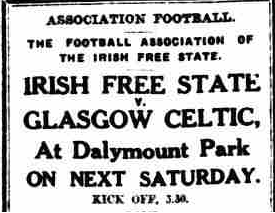 On 23.02.24 a warmly received Glasgow Celtic played a hastily arranged friendly against an Irish Free State XI in Dublin. Celtic won 3-0. There was a 20,000 crowd that spilled onto the pitch and perched on the roofs of stands. The match was a fundraiser to help send an Irish Free State team to that summer's Olympics. Takings were £1,200, which , after tax, expenses and paying for the ground left £400 for the fund. Acknowledging the efforts of the outplayed home team, the Dublin Evening Telegraph stated 'They were opposed by what probably the best football on earth, the highest paid football experts in the world'. 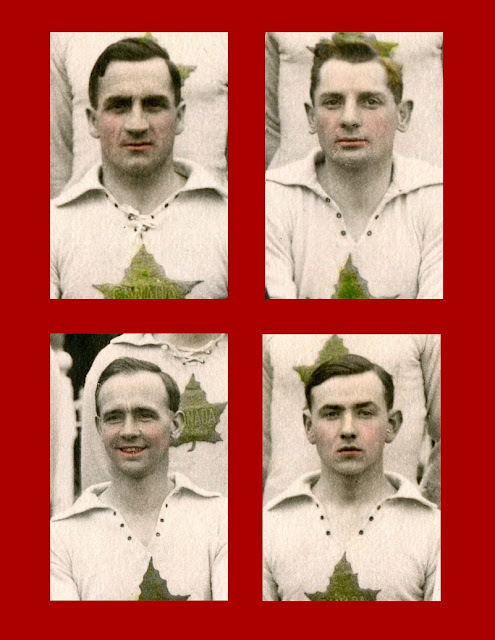 Goals were scored by Thomson, McAtee and Cassidy (all Scotland internationalists). 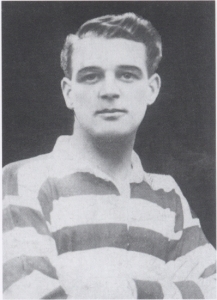 The Celtic line up featured Irish international Patsy Gallacher, who would later represent the Free State. There was talk of another Celtic visit to Ireland in May, when Croke Park was proposed as a (much larger) venue, but this never took place.